We sat down with the man who’s played more for Tipperary more than any one else in hurling history. Brendan Cummins: starred in goal for Tipperary for two decades. REMEMBER THE SCHOOL summer holidays you enjoyed when you were six-years-old? Those couple of months felt as long as your entire 35th year, according to Einstein’s Theory of Relativity. Time speeds up as you get on. Brendan Cummins too felt this. The long summers of his early Gaelic games career saw him squeeze in an intercounty football career as well as forging a reputation between the posts for one of the blue-riband hurling brands, Tipperary. He trotted out to keep goal for the Premier for two decades amazingly, bookending a raft of team and individual honours with two famous All-Ireland wins. There were nights under lights at training on a wet pitch. Mornings in the hurling alley in Ballybacon with only his own breath and the bounce of a ball as the soundtrack. Bright afternoons behind 14 of his countrymen and under the glare of a nation. And he can recall it all. “I can remember a huge amount,” he tells The42 with a copy of his new book Standing My Ground cracked open on a table between us. The book is a manual in self-improvement. We meet a young lad — an only child — who often returns home in tears if things went against him on the pitch or if he failed to get on it. It’s clear he’s still a sensitive, emotionally-intelligent person and has worked hard to develop techniques to recover quickly after setbacks. To be one of the top hurling goalkeepers in the country for 20 years you need to be mentally tough. “I just always felt if things went wrong I would have always blamed myself,” he says. “You have the ability to do it so what’s stopping you. Ability was never going to be for me practice, practice, practice. But then when the game came what was I going to do to let me play the game like? There’s a story in Donal Óg Cusack’s autobiography in which he’s wending his way back to Cloyne in a cab after a few pints in Cork city following a certain championship defeat for the Rebels. The taxi driver — oblivious to his passenger’s identity — is keen to steer the conversation to the afternoon’s game and more anxious still to dismiss the goalkeeper as below standard. Cusack ultimately reveals himself and the car screeches off towards Garryvoe. Set against different topography, the story is mirrored in Cummins’ book, with the then young Ballybacon native sitting in the back listening to another opinionated driver’s harsh criticism. Cummins’ young son Paul is now beginning to shine in goal for the club; would his father be happy to see him continue a career as a goalkeeper? “I don’t know could I go through matches not looking at that end of the pitch. I even know my parents went to the matches and my dad would have went to the terrace rather than the stand because he was less anxious standing there waiting for your fate. At least if you’re on the terrace you can move around a bit. He continues: “As I goalkeeper I always felt it’s gas – because you don’t have a direct opponent. So in training you don’t know if you’re going bad or good. It’s all about your own personal goals because there’s no one scoring 10 points off me in training or me not scoring or whatever. So I had to redefine my goals and from that you become… I won’t say an island, but you are a little bit. Cummins rode shotgun through hurling’s famous revolution years, into summers dominated by Cork’s running and then an era of Kilkenny dominance. 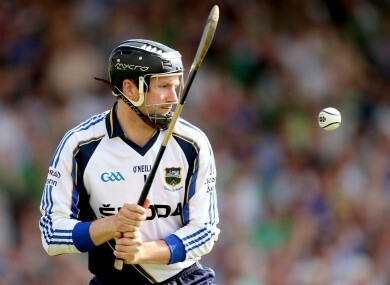 He’s seen seismic shifts in how hurlers prepare and play. “Massive. Every manager who came in – from Nicky [English] in ’98, brought a level of professionalism that I thought couldn’t be matched. But then to see it evolve when Liam Sheedy took over in 2008. It just completely changed. “The amount of time you give up. I don’t think any guy now can play his first national league game at 18 and then 20 years later still be there. I think those days are gone. The commitment is so huge, you’re under the microscope and you are sacrificing more these days. I had a football career and I only turned up playing matches. Do you know what I mean? “You’d never see that happening now. It’s the way it’s gone and it’s driven by everything. It’s driven by management — if they fail, it’s a slant on their work outside the GAA as well. ‘Oh that lad couldn’t manage anything’ or whatever and then he goes in for a job, the media are on his back for the previous two or three months cos he can’t manage players and the reality is it affects his job. The now retired Cummins has mentored the Kerry hurlers, is involved with Ballybacon and is a natural leader. English, Sheedy and Eamon O’Shea are the tent-poles from which Cummins’ career was pegged. It’s clear managing Tipp at some stage is something scratched on his bucket list. What kind of leader would he want beneath his bainisteoir’s bib? “What I see as being the key trait with the lads [English, Sheedy, O'Shea] is they’ve always set the bar for each individual player. They haven’t taken a one-size-fits-all approach. Because of that the amount of time they invested in it is huge. Liam Sheedy always said there’s 168 hours in the week; we’re only together for six of those hours. Winners and losers are separated by the other 162 hours. “So we have jobs and we have sleep and we have to have loved ones and all this kind of carry on. But it’s how you set the bar for the player and then increase the height of the bar when you feel the time is right. And then that’s even before you talk about a game-plan and how you’re going to beat the other team. Standing My Ground by Brendan Cummins is published by transworld Ireland and available to buy here. Email “Brendan Cummins: 'some day I’m going to have to take the plunge myself and see how I’m capable'”. Feedback on “Brendan Cummins: 'some day I’m going to have to take the plunge myself and see how I’m capable'”.